It started in late November, a new, yet slightly familiar ache that plagued my right index finger. It reminded me of that poignant ache one gets when a new nodule is under development. There’s no mistaking that particular feeling – once you’ve had it, you always remember it. But this ache was more generalized. It didn’t seem to focus on one spot, but spread through the entire finger. The ache lingered for a couple of weeks, small and insignificant, fading into the shadow of more momentous flares. Eventually, it sputtered out, like a car running on fumes, but a few days later it roared to life, this time in my left index finger. In my usual fashion, I dismissed its significance, accepting it as the natural rhythm of my disease. I convinced myself it would diminish in due time. I have become accustomed to a certain amount of pain, developing a tolerance in the face of stiffness and flares. Over time that level of pain becomes like white noise – it’s there, but not substantial enough to affect my life. And so, my finger throbbed, revving up like an engine slowly increasing in power. After a while, the tenderness increased and it began to affect my ability to grasp, handwrite and pick up objects. 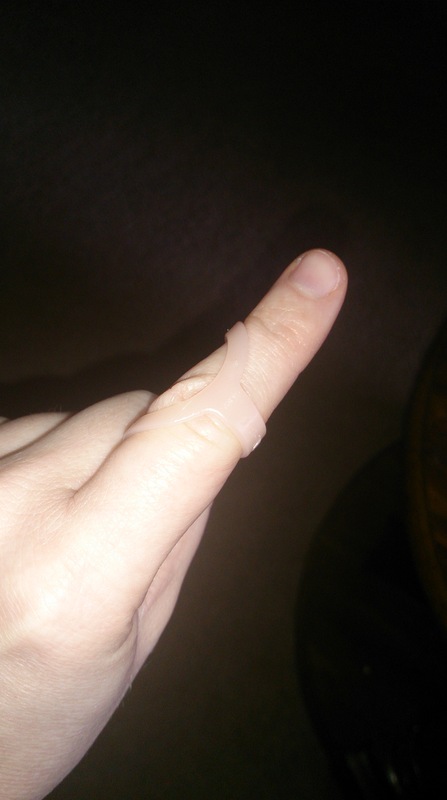 Pain is useful in that it teaches us when to back off – and my persnickety finger was now giving me a clear warning. I started to be watchful about putting any pressure on it, but even with modifying my behaviour, it became increasingly difficult to function. I had been patient long enough – it was time to take action. I booked an appointment with my occupational therapist after a brief visit with my rheumatologist. I was confident she would help me find a way to calm my angry finger. She suggested a ring splint to help stabilize the joint. She opened a small box divided into many tiny compartments. Elliptical plastic rings in various sizes filled each partition. They were a delicate pale pink, almost invisible in the milky background of the box. She tried a couple of different ones, looking for the right size and then slipped one neatly over my finger, settling it over the PIP joint. I noticed an immediate difference – it delivered a soothing gentle pressure around the middle joint of my finger. She explained I had a couple of different options for wearing it – if I put it on one way, it fit snug and tight, providing me more support – if I put it on another way, it fit a bit loose and I had the option of twisting it to cover the top of the joint. 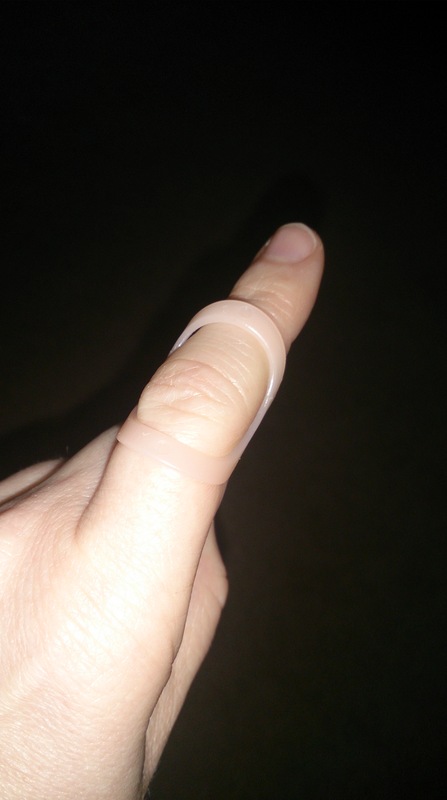 This little plastic ring has become my miracle tool. I’m wearing it now as I write about this experience, and I swear my finger knows, as it struggles against its gentle restraint, attempting to throw me off with another round of aches. But my new ring tames its agitation. It feels strange to have a ring on my finger again. I haven’t wore one in over three years, worried about the unpredictable swelling of old lady RA which might result in one of my favourite pieces being cut from my finger. I was told that if this worked for me, I could have one custom-made in silver that would be both functional and decorative. Hmmm… look at that…in an unusual sequence of events, I’ve just found another silver lining in my cloud of RA. Very good info to have. Glad it is helping you as well. Thank You for sharing. It is helping, thank you 🙂 I noticed a difference right away and it’s wonderful for typing. Hope all is well with you. Cheers. I’ve seen those in catalogues and wondered if they help. My problem is “trigger finger” where the tendon doesn’t move in the sheath and locks in a 90 degree angle. It is always one ring finger of either hand. Why is that I wonder? Anyway my daughter is an OT and recommended this little neoprene band from Amazon.com. When it came I thought no way it would help. I wore it anyway. And it worked! I could straighten my finger all the way in about 10 days. I put it on now when I first start feeling a click in the finger and it stops the progression. Funny isn’t it how simple things can do so much? And I think OT rocks! I’m so glad to hear you found something that works for you. I’m going to check that out. I put my ring on when my finger is complaining and when I’m typing as it helps stabilize my joint. OT does rock 🙂 I sometimes wonder what I would do without them. Stay well.